We produce equipments for complete Automation for Poultry Farms. It includes Fllor and Cage system for Broiler , Layers and Breeder farms. Systems includes Automatic feeding, Watering, egg colloecting, Manure removal, Silo, Fan - Pad System for environment controll system. We do turnkey system in India and other countries. Our product is made of 100% resin and no scrap is used. Product is designed to with stand weight and pressure. 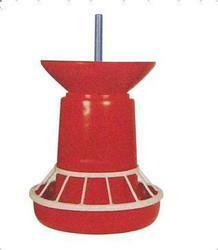 Some one looking for quality product at affordable price can buy this feeder. The special design of the jumboo feeder eliminates feed wastage and thus gives good conversion ratio. It has a higher capacity of the feed comparing others and it holds 10kgs of the feed which helps in reducing labor and saves time of refilling. · Automatic Feed Trolley comes with easy adjustable regulators to adjust level of feed. · Built-In control panel enables to operate the system In auto mode as per the pre-set feeding schedule In Automatic Feeding. · Feed Trolley runs on 0.5 HP motor resulting in Low running costs. Cps Pvc Grower Feeder With Funnel & Grill - 8kg. Specially designed and developed to facilitate separate female feeding for breeders. To meet diverse requirements of our clients in the best possible manner, we are offering a comprehensive Baby Chick Feeder at very reasonable price. Banking on years of understanding of this domain, we provide the finest grade of Parent Feeder. The quality of the offered products is always maintained in accordance to the industry laid norms.